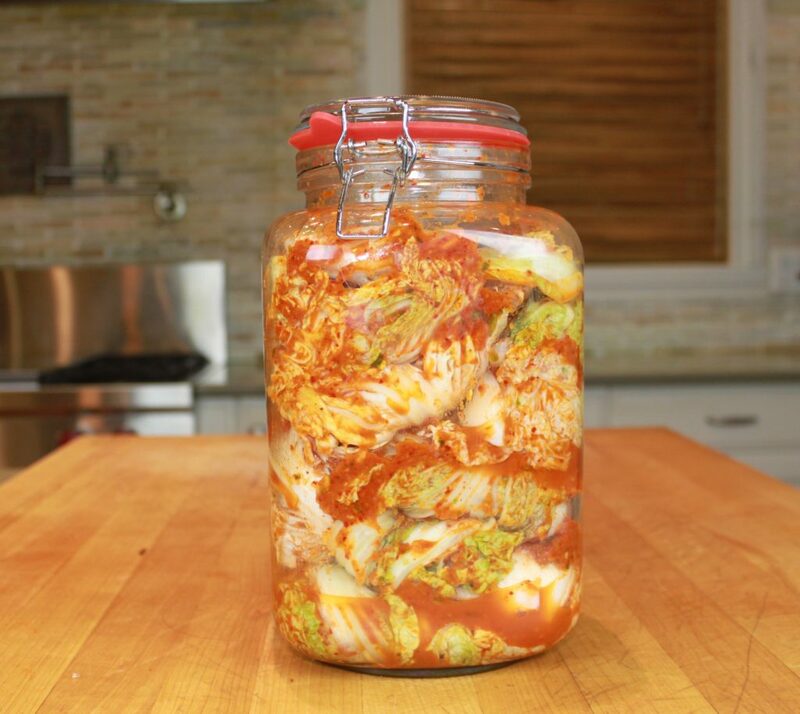 KIMCHI- An addictive, delicious probiotic condiment! The national dish of Korea, once you try it, you're hooked! 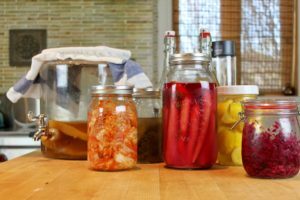 Kimchi is the new darling of condiments- I’ve seen it pop up in vegan and health-conscious restaurants, and there is even a food court chain named after this over 2000-year-old Korean condiment. It is the national dish of Korea and there are reportedly more than 200 ways of preparing it. 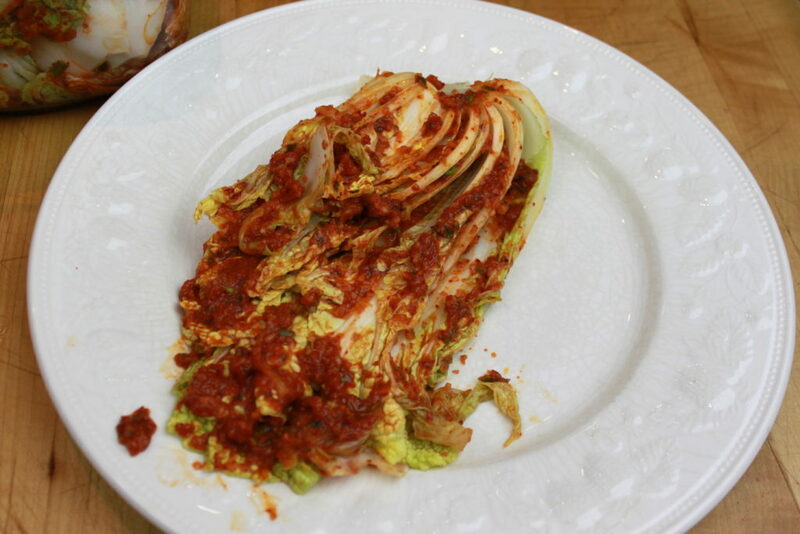 What is all the fuss about kimchi? Try it once and you’ll get it! 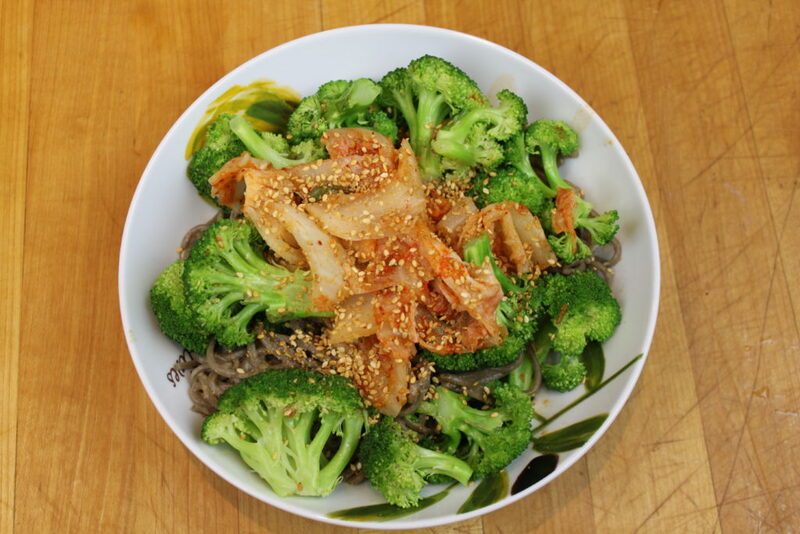 Not only is kimchi super, insanely delicious, it is also packed with nutrients and probiotics. It is rich in vitamins A, B and C, as well as iron, calcium and selenium. For those of you who are afraid to eat cabbage, fear not! 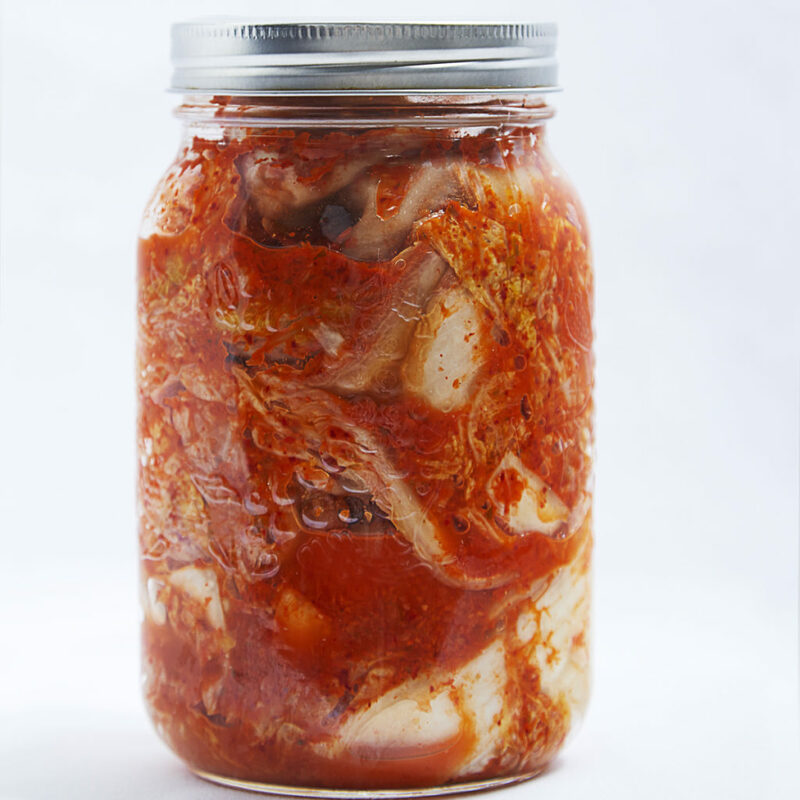 The lacto-fermentation process makes the kimchi easier for us to digest, giving us the high fiber benefits without gastrointestinal distress! 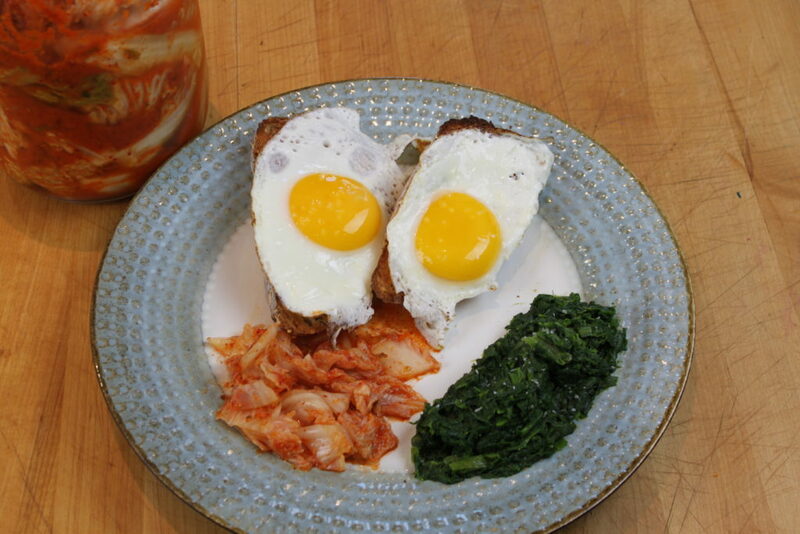 There are endless ways to enjoy kimchi. In our house, I always include it with my eggs at breakfast. 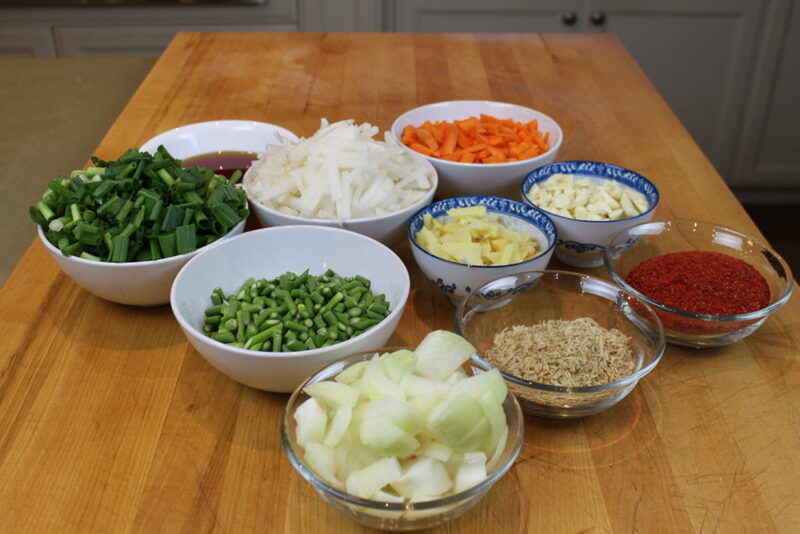 My husband eats it with ground meat dishes, and both my daughter and I love adding it to soba noodles with peanut sauce. 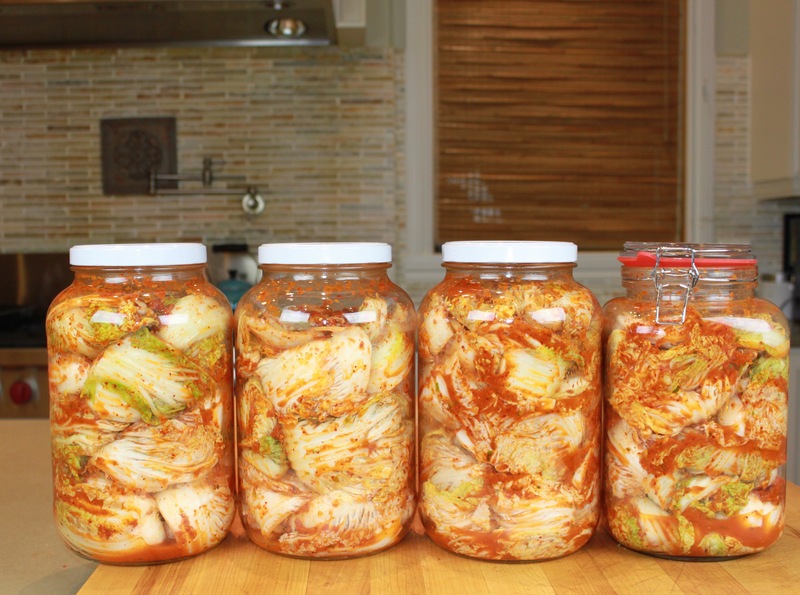 Since kimchi is such an essential staple for our family, I always make a mega batch. The preparation might be time-consuming, but worth the effort! 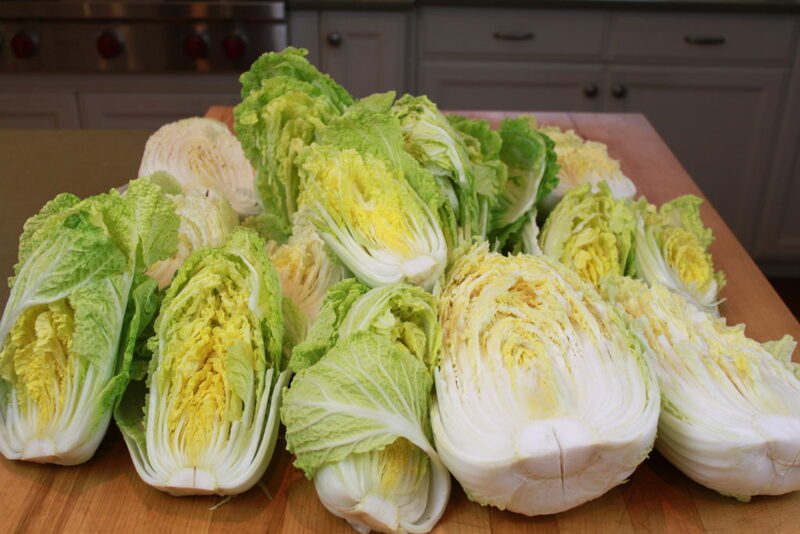 I adapted the below recipe from the fantastic Korean chef Maangchi’s version of napa cabbage kimchi. It has never failed me and has gotten rave reviews from my friends and family. Kathleen, my friend and photographer (Studio Kat Kennedy) of some of the photos on my website is now admittedly hooked after trying my kimchi and sends me frantic emails for more when her supply is running low! My latest mega batch of kimchi! Remove outer layer leaves. Make a small slit in the base of the core and pull apart to split the cabbage in half. Make a second small slit in the core of each half. 2. Dip each half in filtered water, enough to saturate . Sprinkle each layer of leaves with kosher salt, applying more salt at the thicker stem end of the leaves. 3. Let salted cabbage sit for 2 hours, flipping the halves over every half hour. Be sure to add the salted liquid that has collected at the bottom of the container to the halves after each flip. 4. After 2 hours, thoroughly wash cabbage and split in half again using the second small slit you made in the core. Let drain in a collendor. Bring the 2 cups of water to a boil, whisk in rice flour. Cook on low heat for 10 minutes, stirring to prevent lumps. Add sugar and cook for an additional 1 minute. Remove from heat and let cool to room temperature. 1. Using a food processor, combine the rest of the ingredients (vegetables, pepper flakes, shrimp and fish sauce) and cooled porridge. 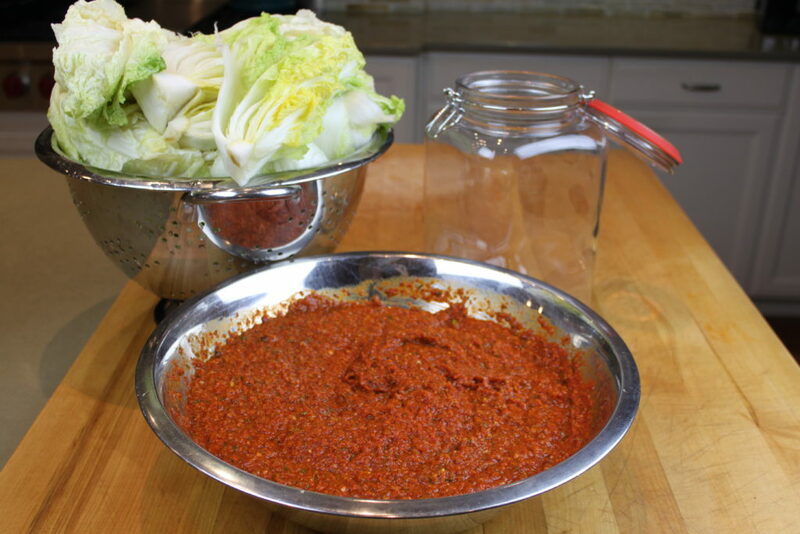 Look at the beautiful color of the kimchi paste! 2. Blend until you achieve a paste consistency, small pieces of vegetables are ok and add to the crunchy texture of the finished kimchi. Apply the paste to each leaf- make sure to wear gloves to avoid red and sore hands! 3. I advise wearing disposable gloves when applying the kimchi paste to avoid red-stained and sore hands! Apply the paste to each leaf of each cabbage half. Roll up the half and place it in the fermentation container. 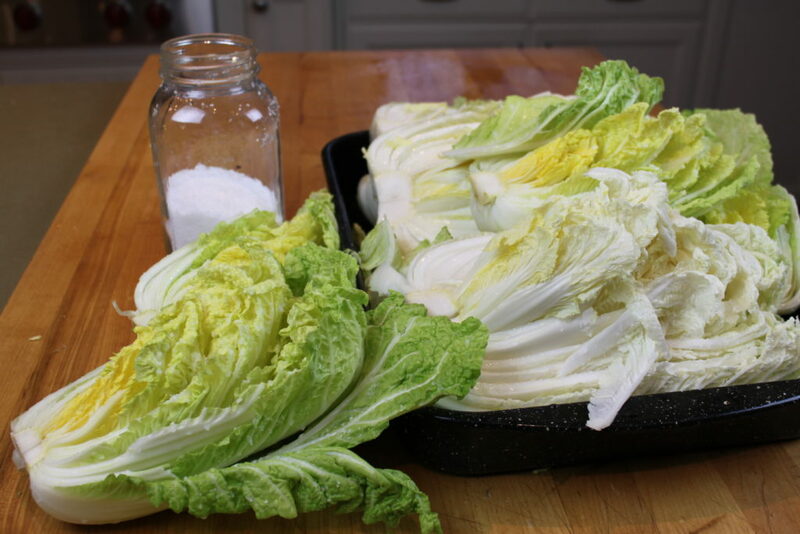 Continue adding the cabbage in this way leaving a 1″ space to the top of the container. Place lid on container. 4 Leave containers at room temperature for 3 days to 1 week. After 1-2 days, you should see bubbles forming as the beneficial lactobacillus get busy starting up the lacto-fermentation process. Sample after 3 days and store in the refrigerator when you are happy with the taste. Dip each half in filtered water, enough to saturate . Sprinkle each layer of leaves with kosher salt, applying more salt at the thicker stem end of the leaves. Let salted cabbage sit for 2 hours, flipping the halves over every half hour. Be sure to add the salted liquid that has collected at the bottom of the container to the halves after each flip. After 2 hours, thoroughly wash cabbage and split in half again using the second small slit you made in the core. Let drain in a collendor. Using a food processor, combine the rest of the ingredients (vegetables, pepper flakes, shrimp and fish sauce) and cooled porridge. Blend until you achieve a paste consistency, small pieces of vegetables are ok and add to the crunchy texture of the finished kimchi. I advise wearing disposable gloves when applying the kimchi paste to avoid red-stained and sore hands! Apply the paste to each leaf of each cabbage half. Roll up the half and place it in the fermentation container. 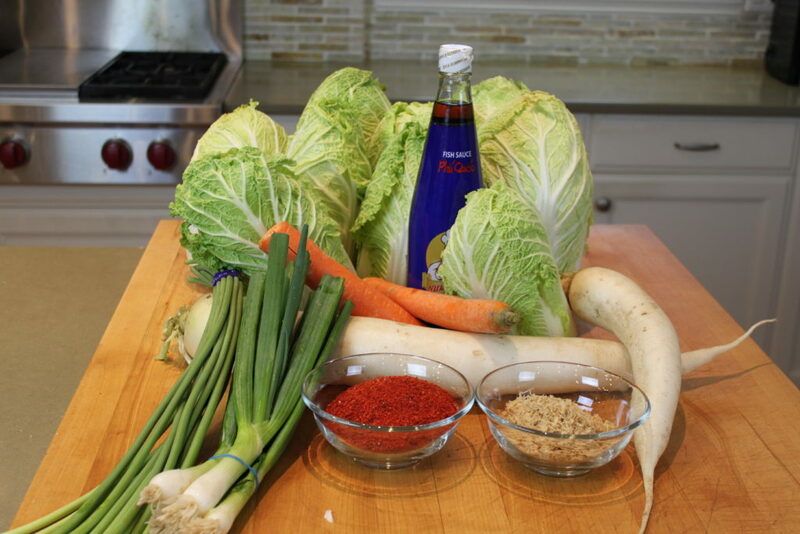 Continue adding the cabbage in this way leaving a 1″ space to the top of the container. Place lid on container. Leave containers at room temperature for 3 days to 1 week. After 1-2 days, you should see bubbles forming as the beneficial lactobacillus get busy starting up the lacto-fermentation process. Sample after 3 days and store in the refrigerator when you are happy with the taste. Pingback: South Korean Women Will Soon Outlive us All. What's their Secret? Hi Jody! Pleasure to meet another Jody! Thanks for your question- I’m not Vegan, but I do make a Vegan version of kimchi for my Vegan fans. I use red miso in place of the fish sauce and shrimp. Red miso is the strongest-tasting of the misos (red, yellow, white) and helps to replace the umami flavour we get from the fish sauce and shrimp. I have also seen people use soy sauce, dashimi (kelp broth) or other seaweed. Where do you get garlic shoots? I’ve never noticed them in the veggie shop. Do you grow them yourself? Would garlic chives work? I can’t wait to get started! Looks a little time consuming. But we’ll worth the taste and health benefits. Good for you Jamie! It is worth the effort and best to make a large batch to have lots in reserve. Let me know if you need any help!